An attempt on Quark's life forces Odo to reconsider the first case he was ever tasked with solving, back when Cardassians ran the station. The opening is too noir-esque. I was certain it had to be a holodeck simulation--some kind of bad holonovel based on something like "The Royale"--and was surprised to discover that it isn't. There's having fun with genre, and then there's just stinky cheese. I really love Odo's first security log. "Humans have a compulsion to keep records and lists and files, so many, in fact, that they have to invent new ways to store them microscopically, otherwise their records would overrun all known civilization." At the end of their first meeting, why does Kira call Odo "Constable"? Is it a nickname rather than an actual rank, or is it a script mistake? There are a lot of auspicious meetings in the flashbacks: Odo and Dukat, Odo and Kira, Odo and Quark, Kira and Dukat. I like the use of blue filters to distinguish between flashbacks and present time. It's a nice visual cue. Good make-up, hair, and costume changes for the flashbacks. Odo and Kira definitely look younger. There's no resolution in the flashback story. How does Odo become the station's security chief under Dukat when he fails to solve the very first case he is given? How does the Cardassian leadership respond to a lack of any fingered criminal for the crime? How does Odo manage to let it go for so long, and why does it take him five years to figure out Kira's real involvement? These are the borders of a rather large plot hole. This is a good episode that is brought down by its own self-awareness. The noir trappings are just way too much. I love a good hard-boiled detective tale as much as the next guy (or more, really), but all the noir stuff is too out of character for everyone involved. The Bajoran wife who is dressed like she just walked out of a 40's flapper ball, Odo's cheeky security logs, etc., are too cute to be consistent with what we know, and that's a significant problem. Still, I greatly appreciate the backstory, and even the fact that it reveals a slightly different edge to Rom's one-dimensional character. 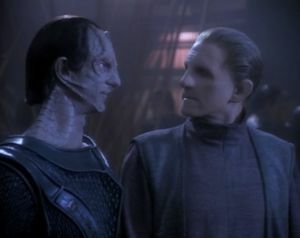 I also like that it grows the relationship between Kira and Odo by putting a potential obstacle in it. We know Kira has killed people before, but this makes it slightly more real, forcing us--and Odo--to question her moral judgment.